The Zodiac Sign Aquarius Woman (January 21 - February 19), Aquarius Personality Traits for Female born under January Zodiac signs. Aquarius woman is always elegant, charming and attractive, she enjoys communicating, has very strong principles in life, but sometimes not averse to depart from them in favor of fun games or adventures that give her a new inspiration for creativity and new achievements. She has many friends, listens to them with pleasure, being a true friend to whom one can complain and cry in the vest for both women and men. The Aquarius woman has an amazing feeling, she always feels the wind direction, the mood of those around and their problems, and may be the first to rush to the aid of friends even if no one asked her for help. 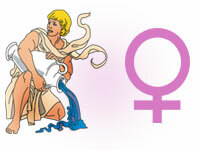 Aquarius woman is very focused on the society, communication and social links. She finds it very important to feel herself as needed by people, she does not care about her image and reputation, because this is her business card that needs to be presented to new friends. The representative of this zodiacal constellation says only what she really thinks, and her talkativeness sometimes goes beyond measure when she tries to attract maximum attention to herself through verbal flow. Aquarius woman is always on guard for the interests of good and justice. She easily rebels against lies and aggression, even if this happens with strangers. She also does not apply the effects of pressure or aggression on herself, at best, she will simply avoid the person or company in the future, at worst - she will rise in an active battle. However, the Aquarius woman very rarely goes into active fighting, only when there is no way to avoid contact with these people. The representative of this zodiacal constellation is very friendly, she melts in a warm friendly atmosphere, she is inspired by open honest relationship with people. She tries not to argue with others, even if she has to "wrinkle" her opinions and make concessions to another person. The Aquarius woman tries to demonstrate the correctness of her point of view in life, in practice, and under a convenient opportunity will demonstrate the debater who was actually right, even recalling very old disputes. Aquarius woman is always bustling and active, she is constantly searching for something, she is repelled by the mediocrity and ordinariness of affairs and relationships, compelling her to search for something new and interesting. The Aquarius woman in achieving her goals and plans, will never resort to cunning and crafty plans, preferring to honestly earn, openly and with a pure heart. She will never go in the pursuit of self-interest against other people, and happily helps all around, if she feels they need her help. Sometimes it seems that the Aquarius woman does not always correctly assess reality, because often, while helping others, she acts to the detriment of herself, depriving herself a profitable position or wealth. But this seems not to worry the Aquarius woman a bit - a revolutionary who came to this world to change it for the better. In relationship with her man, the Aquarius woman will not be satisfied with little, she needs all his attention and passionate love of which he is capable of. But if the Aquarius woman does not find a feeling that is able to arouse and ignite her passion, she will prefer to stay alone in the eternal search for her ideal man. She will be faithful to her husband, will try to do everything for him in the family. However, one shouldn't forget about this woman's desire for freedom and communication, without which she will simply wither away. She cannot be made an eternal housewife and tear off the society from her, else, the couple will witness serious scandals and wars, and the winner is always known - the Aquarius woman, since she will without regret part with that man who tried to deprive her of her independence. She does not attach much importance to physical love, but responds to her husband's gusts of passion with equally strong gusts. & element of animal eastern sign . Eastern animal sign and element are very important. Amazing! This is me all the way! But i would not be like this. Wow! This is really me. That's me I love me some Gloria. Wow! I sound awesome! Aquarius rules! Full description of Aquarius Woman, character traits and personality characteristic for female Aquarius.